Gulfstream Park will celebrate its 80th anniversary during the 2018-2019 Championship Meet, honoring a long tradition of Thoroughbred racing while also envisioning a future of sustained success through innovation. Gulfstream Park takes pride in having hosted racing's all-time great horses and horsemen during its storied history and looks forward to maintaining its stature among the world's premier racetracks by positioning the Hallandale Beach facility for a bright future while enhancing the fan experience through world-class entertainment, events and dining. The 90-day Championship Meet, which will get underway Saturday with an 11-race program headlined by the $1.11 million Claiming Crown and run through March 31, will be highlighted by the $16 million Pegasus World Cup Championship Invitational Series Jan. 26. The $9 million Pegasus World Cup Invitational (G1), the richest race in North America, and the $7 million Pegasus World Cup Turf Invitational (G1), the richest turf race in North America, will anchor the 3rd annual event that has already made significant inroads into enriching the fan experience of a day at the races in its first two years. This inaugural running of the Pegasus World Cup Turf Invitational, which has taken the place of the Gulfstream Park Turf (G1) on the Championship Meet calendar, will be contested over a turf course that has been fully renovated at the cost of approximately $1 million. The 2018-2019 Championship Meet stakes schedule will feature a record 105 stakes worth a record $29.079 million. “There's a great deal of anticipation and excitement about the Championship Meet,” said Gulfstream General Manager Bill Badgett. “Beginning with Opening Day and the Claiming Crown, there's a big event nearly every weekend through March. The $16 million Pegasus World Cup Championship Invitational Series will not only bring the world's top dirt horses to Gulfstream but has expanded to include a turf race. Our 3-year-old series, the best in North America, will culminate with the $1 million Florida Derby. We look forward to playing host again to the Clasico Internacional del Caribe Dec. 8 with our friends from Latin America and the Caribbean, as well as the Eclipse Awards Jan. 24. Fans will see numerous upgrades throughout the facility including a new turf course. The 68th running of the $1 million Florida Derby (G1), the prolific Triple Crown prep race for 3-year-olds, will be run on a March 30 program with seven stakes, four graded. 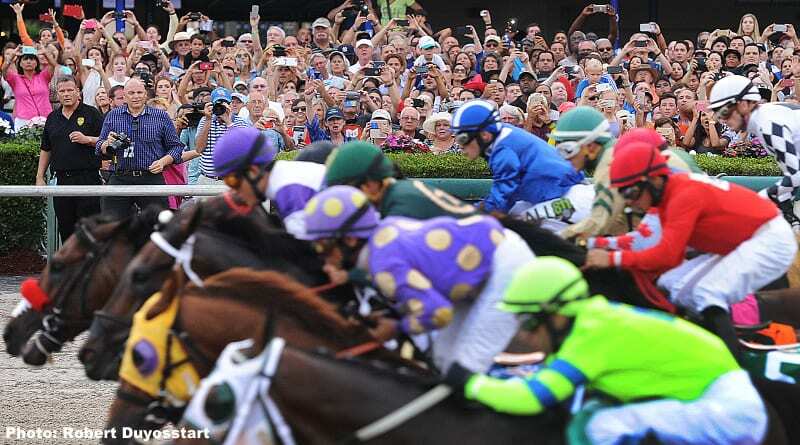 The Florida Derby will again highlight Gulfstream's heralded program for 3-year-olds. Three of the last six winners of the 1 1/8-mile marquee event have gone on to win the Kentucky Derby (G1). While the Pegasus World Cup Invitational Series and the Florida Derby will be the highest profile events, the Championship Meet will be frequently celebrated by other multi-stakes programs, starting with the Claiming Crown, a nine-stakes tribute to the claiming horse, on Saturday's opening day program. The Claiming Crown will be followed a week later by the Clasico Internacional del Caribe, a five-stakes event for horses based in eight Latin American and Caribbean countries. Six $75,000 stakes for 2-year-olds will support the Clasico del Caribe on the program with more than $1.3 million in purse money. Other dates to remember: Dec. 15, when 2018 Florida Derby winner Audible is scheduled to prep for the Pegasus World Cup in the Harlan's Holiday (G3) on a card with five graded-stakes; Jan. 5, when the $100,000 Mucho Macho Man will kick off Gulfstream's Road to the Triple Crown on a program with four other stakes for 3-year-olds; Jan. 19, when the Sunshine Millions will be renewed, anchored by the $200,000 Classic for Florida-breds; Jan. 26, when the Pegasus World Cup Invitational Series will be supported by seven other stakes, four graded; Feb. 2, when the $350,000 Holy Bull (G2) for 3-year-olds will headline a card of five graded-stakes; March 2, when the $400,000 Fountain of Youth (G2), the final prep for the Florida Derby, will top a card of nine graded-stakes. Trainer Todd Pletcher, who won his record fifth Florida Derby last season with Audible, will seek his unprecedented 16th consecutive Championship Meet title, while Luis Saez will strive for his third straight jockey title following his record-setting 137 victories last winter. This entry was posted in Pegasus World Cup and tagged Florida Derby, gulfstream park, gulfstream park championship meet, pegasus world cup by Press Release. Bookmark the permalink.